Ok, nevermind what I said in the last blog post. This art is good. Definitely. Covers don't always represent what's in the comic, so I'm kinda eager to see a few pages. Screw the haters, I'm still stoked about this. What's the worse that could happen? That it goes the route of so-bad-it's-awesome? Far as I'm concerned, a Saturday morning cartoon-esque series is just right for Megaman. So... What was wrong with that art style, again? 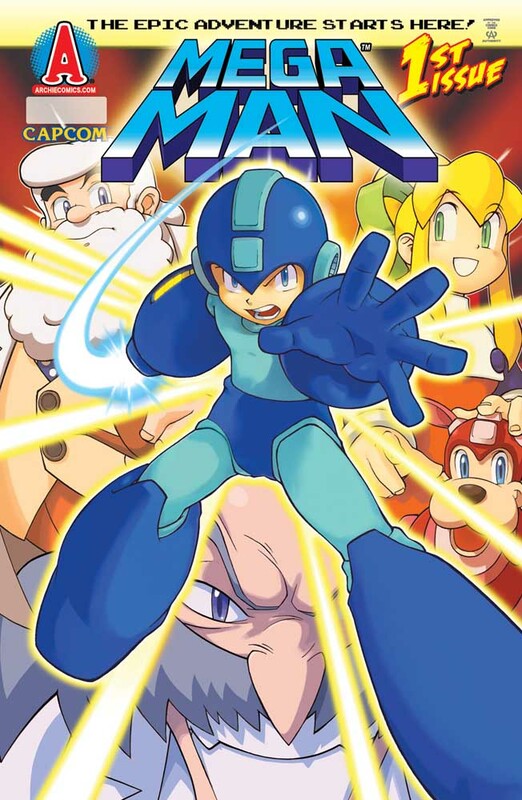 Not only did I not see this coming (a new Mega Man comic series, written by the guy responsible for the fantastic Sonic comic! ), but this art is WONDERFUL. Exactly my favorite kind of art for the Classic series. Sadly I couldn't find any other pages without digging through boxes to scan my own copies, but if Spaz is good with ANYTHING it's emulating the style perfectly. Having first hand knowledge of Ian pulling the Sonic comic out of the toilet and spraying down with a hose to let it air dry I can say I'm stoked about him getting his hands on Megaman. I'm loving the looks of this. Hopefully we'll get some more info as more becomes available. Always wanted to get into Spaz's work, but the Sonic story never really engaged me. Do we know if this has any official bearing on the story? Did I miss that bit? Ain't gonna deny, the cover looks pretty badass. Just like the ol' Dreamworks Megaman comic (Shut up, I actually really loved that comic series and wished it went on!). It'll be interesting to see this upcoming comic. Past comics I've read from North America barely focused on the robot masters at all and it made them bland. What good is a hero without engaging villains? Here's to hoping that the writing is on the level of the art. I'm hoping that the Light bots are good guys, much like in Megamix and Powered Up. I always liked the whole "Light Numbers vs. Wily Numbers" thing, and it would be awesome if Archie did that here. That being said, I also really hope that the people at Archie can distinguish that Mega Man and Mega Man X are not the same character. There were a few things here and there in the Dreamwave run that made me suspect that the writers of that comic thought they were the same character. I hope Archie does NOT make the same mistake. And man, I'd love to see an eventual Mega Man/Sonic crossover. Keep in mind when the Sonic Comic started. Keep in mind that it's still going strong. Ok, Capcom did something right here. I approve. PLEASEEEEEE let them make an X series version too. PLEASE. I will be happy as clams. Woohoo, a news reveal with lovers and haters where I actually get to be on the loving side! Shame I don't read comics much. 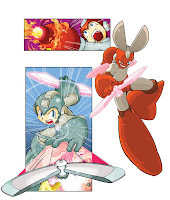 If anyone remembers the Mega Man Artbox card collection a few years ago, there were some special chase cards. The chase cards were drawn by this artist. That Cut Man is one of the pictures used on one of the cards. The art reminds me of Hideki Kimiya (sp?) he did the art for legends (?) and some art in the R20 book. I remember talking with my friends a year or two back about what it would be like if Archie comics did Megaman. I can't say it's something I -wanted- to see happen, but I have to say this has me hopeful. I look at this and it reminds me of Dreamwave's version (which was excellent while it lasted before they were driven right into the ground), so I'll be getting this hopefully. From the looks of it, Archie lets you subscribe to comics. I'm totally subscribing to this no matter how good/bad it is. Branching into the X series?